Visit the ruins of two fossilized ancient towns – Pompeii and Herculaneum – in one day on this must-do tour from Naples or the Amalfi coast! After enjoying a Pompeii tour of the UNESCO-listed archaeological site with a knowledgeable guide, you can relax over a delicious, typical lunch. 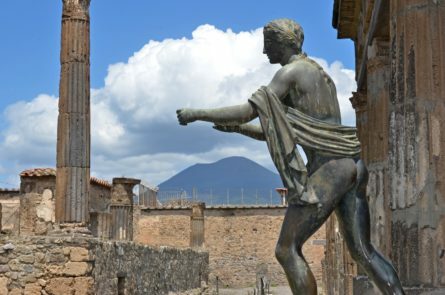 Your private guide from Italy’s Best will lead you on a Pompeii tour to discover the archeological sites. See first-hand the remains from the calamitous eruption including the House of the Tragic Poet with its elaborate mosaic floors, the town Basilica and Temple of Apollo as well as the plaster casts of those killed during the eruption, their bodies captured in motion as they tried to outrun the lava. Leading you away from the crowds, you guide will show you some of the lesser-visited areas including the cemetery, the baths and a brothel. Spend the remainder of the day in the coastal town of Ercolano, touring the lesser-known (but equally captivating) ruins of Herculaneum with an expert guide. The remains of Herculaneum are incredibly unusual because the city was buried in mud, which preserved the structures and furnishings. Discovered by chance in 1709, the Greco-Roman urban landscape contains folding doors, peristyles, mosaics, paintings, household objects, and even the equivalent of a bank. The walls of the House of the Bicentenary carry the imprint of a cross, confirming that the Apostle Paul did indeed arrive in Pozzuoli in 63 AD. The Villa containing papyrus is unusual; it was the library of Caesar’s father-in-law, Lucio Calpurnio Pisone, and there were a limited number of shops.